I am of course *seriously* excited about this. I've had my hair cut, I've been gokked* and now have some halfway decent clothes, and have just anointed my scalp and neck with hair dye. Hopefully some of it is on my hair, too. I won't know until Saturday whether or not they are asking for public votes...believe me, I'll let you know! In the meantime, duplicate Harry Hill meerkats are available from my Folksy and Etsy shops, and don't forget to enter the giveaway for a fabulous Alice in Wonderland scarf by www.nowonder.etsy.com . Giveaway closes tomorrow. ooooh nifty I bet you are so excited :-D congrats! Well done !!! Really Exciting!!! Hope you have a blast! You look great, Nifty! What a wonderful and exciting experience this has all turned out to be. The photo is pre-haircut, I'm a changed woman now! Congratulations nifty - and good luck! wow this is great !!! Oh wow, how exciting! Best of luck! It's just a shame they couldn't come up with a slightly catchier headline! TOTALL AMAZING! 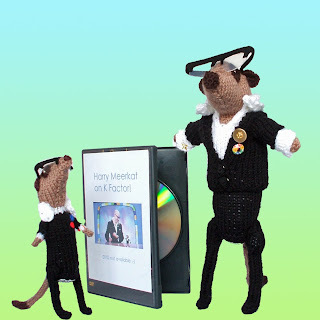 I've been loving watching the Harry Hill Meerkat adventure unfolding! 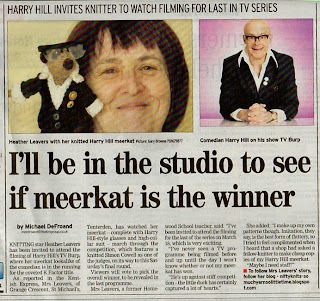 Your Harry Hill meerkat is made of win and I hope you have a good adventure at the studio. ...if you carry on like this you're going to NEED staff!